A quick day trip through Simpcw Territory will reveal numerous beautiful landscapes and breathtaking natural vistas. Thankfully, there are many Provincial and Federal Parks located in Simpcwú’lecw, which ensures that some of the wildlife and scenery will be protected for future generations to enjoy. Two parks in Simpcwú’lecw are particularly notable- Wells Gray Park and Mt. Robson Park. 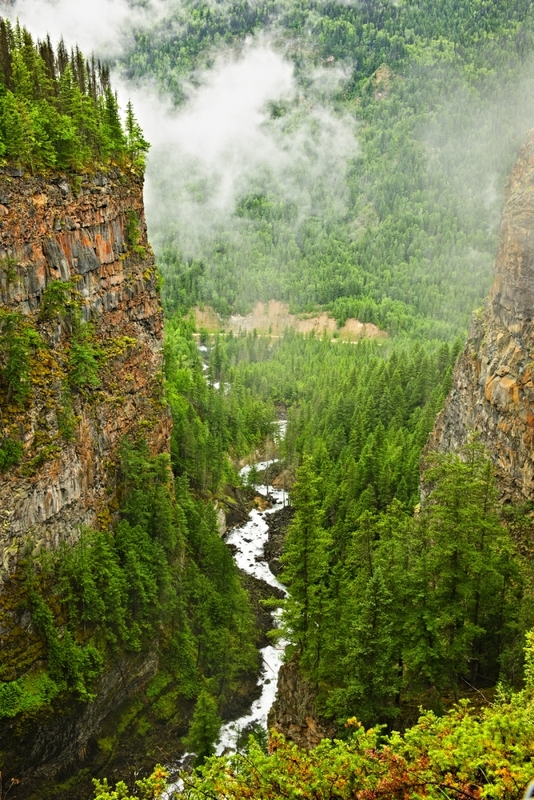 Wells Gray Provincial Park is home to Helmcken Falls (Canada’s 4th highest waterfall!) as well as numerous sites that are significant to Simpcw’s history, such as trails, fishing spots and kekulis. Mt. Robson Provincial Park is named after the highest peak in the Canadian Rockies and is the second oldest park in BC. Both locations have been protected, and when visiting you will be able to experience the beauty of our valley in much the same way our ancestors did in days past. The Raft River Viewing Platform provides another excellent chance to observe the natural wonder of Simpcw Territory. Located about 5 KM North of Clearwater, this platform was created in order to allow travellers to witness the return of the salmon to their annual spawning grounds. Additionally, the platform overlooks the site where Simpcw fishermen return each year to fish, using traditional fishing methods like gaffing and seine netting. This site has been the optimal fishing spot for the Simpcw people for many years; today, the First Fish Ceremony is held there every summer to celebrate the return of the salmon. As part of Simpcw’s dedication to a healthy population, recreational activities are often held for community members. The Chu Chua Men’s Fastball Team participates in games with other Nations in the area. Basketball is a very popular sport for Simpcw, with the men’s, women’s, and master’s teams all taking part in the annual Kamloops Basketball tournament, held each year over the Easter holiday weekend. Within Chu Chua, several slo-pitch tournaments are held each year as well. The Chu Chua Fire Department, the CCR, and the Juanita Haller Memorial Ladies tournaments are all highly anticipated and eagerly attended each year, with a lot of fun for all involved. Our youth participate in sports through local schools as well, and Simpcw has been represented in the Barriere Minor softball league from 1974 until today. Aside from organized team sports, many members of Simpcw enjoy other outdoor pursuits- the Youth Group has a snowboarding team that meets most weekends over the winter, and currently, crews have been developing trail systems to allow for mountain biking and hiking in the summer months. The Health Department often organizes special classes in yoga, kick boxing and other exercise to promote activity at any age and ability level. Information about recreational activities and tournaments are often posted on the message board in the main band office, on the calendar of events on this website or in the monthly newsletter sent out to community members.